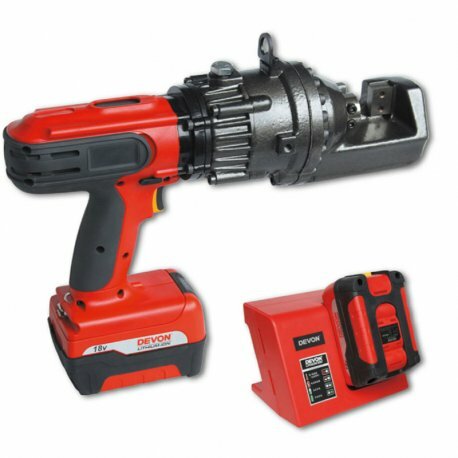 Battery Powered Electrohydraulic Rebar Cutter. Cordeless and light weight, it runs on a 18V Lithium - ion battery. Delivered including protection steel case. Those inner components subject to continous wearing and stress are tempered to ensure longer working life. Higher traction force and smooth running thanks to its oil bathed trapezoidal and helicoidal gears ensuring top performance for heavy users, and minimizing maintenance. High efficiency electric motor IE3 type. Featured with impact clutch which prevents slippery on cutting impacts and optimizes performance and accuracy. Interchangeable 4 faced long life cutting blades, rectangular shaped and made of chrome-steel. Comfortable and ergonomic foot or hand control with safety shield. Integrated lifting hook and lever+ transport wheels to ease final positioning at site.